Who could imagine that a fictional magazine story published in 1976 would inspire such a cultural revolution? British rock journalist Nik Cohn’s Tribal Rites of The New Saturday Night article documented the Saturday-night rituals of a group of working-class Italian-Americans in Bay Ridge, Brooklyn, who held dead-end jobs but found meaning during their nights of dancing at a local disco. Its premises would eventually form the backbone of Saturday Night Fever, a spectacular film that would be deemed ‘culturally, historically, or aesthetically significant’ by the US Library of Congress in 2010 and slated to be preserved for all time in its National Film Registry. The plot of Saturday Night Fever tells the story of Tony Manero, a young Italian-American man with a talent to dance. Played superbly by John Travolta, Tony has only one ambition: to become the disco king. When he meets Stephanie Mangano, who also dreams of a life beyond the city, they decide to train together for a dance competition. The film also showcased aspects of the music, dancing, and subculture surrounding the disco era: symphony-orchestrated melodies, retro clothing styles and costume, graceful, groovy choreography and the courting habits of people of time. Its success widened the disco phenomenon worldwide and revived a genre that critics believed was about to run its course. Today, mention the word ‘disco’ and one will immediately think of Saturday Night Fever; such is the impact the film had left behind. Who can forget that iconic scene of John Travolta executing the point and strut with flair and feeling? The dance “Do the Hustle” became an overnight craze; a dance move that defines an era and up till today the move was never forgotten. The success of Saturday Night Fever is also amplified by the involvement of Bee Gees in its soundtrack, which was composed and performed primarily by the trio’s members Barry, Robin and Maurice Gibb. Today, the songs sung and performed in the movie such as Night Fever, Stayin’ Alive, How Deep is Your Love, If I Can’t Have You, Jive Talkin and More Than a Woman. The Bee Gees won a total of five Grammy Awards for its soundtrack, forever immortalising the film and its legacy. The soundtrack might rule the airwaves in the 70s but its legacy continue to find its way into the hearts of many younger generation today; with continuous covers done by artistes such as Michael Buble, Kelly Rowland, and youtube sensation which include Jason Chen and many more. It would be 21 years before the movie will end up on stage, premiering at London’s West End in 1998 and New York’s Broadway in 1999. Since then, Saturday Night Fever has been seen by over 10 million people with over 2,800 shows in more than 20 countries across the globe including Italy, Argentina, Japan, Australia, Germany, Greece, Netherlands, Sweden, Spain, South Africa, Czech Republic and Finland. One of the longest running musical ever to date, the show continues to remain relevant in today’s modern world as it bridges the young and old with a common interest of a fantastic musical performance. Some Malaysian fans have already experienced the musical when, back in 2004, the Australian production made it to Istana Budaya with a sold out show. This 2015 production will be imbued with a slight contemporary edge while retaining the film’s grittiness and realistic portrayal of the disco era and the entertainment value of its music and dance moves. After all, there is a reason why the movie remains a cult favourite even after 38 years have passed since the film was released—it has that timeless appeal that will withstand the test of time. It is after all the all-time Bee Gees’ Smash Hit Musical! It is a legacy of how one movie, one music and one dance defines one era! 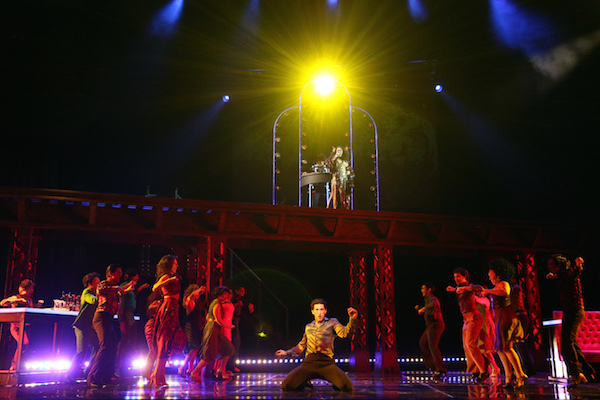 The Broadway International Production of Saturday Night Fever The Musical Asian Tour, brought to Malaysia by Milestone Production, will play at Istana Budaya from Sept 4 to 13. Tickets are priced at RM568 (VVIP), RM398 (VIP), RM338 (CAT A), RM268 (CAT B), RM138 (CAT C) – (Ticket prices are inclusive of 6% GST but not inclusive of RM4 ticketing fee). Current promo up to Buy 4 Free 1. For more information on the ongoing ticket promotions please log on to www.milestone-production.com or call 03-92228811.